* Why Is Islam So Different In Different Countries? The rise of Islamic State has led to much speculation about the group's origins: how do we account for forces and events that paved the way for the emergence of the jihadist group? When the Indian and Pakistani Prime Ministers had agreed, late last year, to resume official level dialogue, it led to unrealistic expectations. This is the curse India-Pakistan meetings suffer from. With only a few exceptions that one could cite, there is no other bilateral meeting which triggers such extreme show of emotion as much as the expected and often stalled exchanges between India and Pakistan do. Within a month of its announcement, Pathankot, the Headley disclosures and the sordid Jawaharlal Nehru University (JNU) mess demonstrated the multiple pitfalls that can hold bilateral engagement hostage. Many would argue that there are far too many elephants in the room to allow for any kind of meaningful discussion leave alone a negotiation breakthrough. To begin with, there was the liberation struggle of Bangladesh, which was then an integral part of Pakistan- East Pakistan. Military historians will tell you that Pakistan’s crushing defeat in that war, the emergence of a new nation and the fact that the Indian army could well have entered Islamabad and in the process ‘liberated’ the Pakistan-occupied Kashmir (POK) are memories that are deeply ingrained in the Pakistan military’s psyche. For them, India is an enemy state that needs to be broken up, starting with Muslim-majority Kashmir, to avenge the loss of East Pakistan. This is the sole preoccupation of the Pakistan military. The proposed Foreign Secretary level talks between India and Pakistan has been widely perceived to be linked to Pakistan acting fast on the probe into the attack on Pathankot base of the Indian Air Force (IAF) by the terrorists of Jaish-e-Mohammed, a fundamentalist outfit promoted by Maulana Masood Azhar. 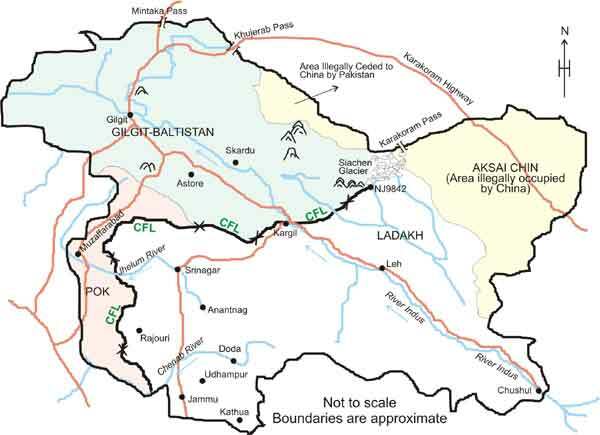 To complicate the matter further, the proposed talks are likely to run into a rough weather over the recent move by Pakistan to integrate the so called Northern Areas made up of Gilgit and Baltistan into rest of the country ostensibly under “Chinese pressure”. Egged on by Beijing, Pakistan is working towards officially declaring disputed Gilgit-Baltistan region as part of Pakistan. Of course, in Islamabad the Indian envoy made the point that Foreign Secretary level talks between Pakistan and India are not conditional to the Pathankot attack probe. ”I cannot give any particular date for the Secretary level talks but foreign secretaries from both the countries are in constant contact” noted Indian High Commissioner, Gautam Bambawaly. Unfolding itself in a variety of ways, the menace of terrorism is being fed and furthered by money and material from across the world. To this end illicit monetary exchanges (through hawalas and other clandestine means) and production and circulation of counterfeit currency in abetting terrorism and other forms of extremist violent activities is significant. This article puts forth recommendations on the issue of counter-terrorism finance (CTF) both at home and abroad and the ways to curb this grave challenge. With charity beginning at home, needless to say that it is India – which has been the unfortunate target of many terror strikes ever since its independence – that one ought to begin with. Thus, the Government of India may like to designate individuals under its domestic sanctions listing provisions relating to UN Security Council Resolution 1373; currently only proscribed entities are listed under the relevant Unlawful Activities Prevention Act (UAPA) provisions. Given the lack of effective implementation of sanctions measures under UN Security Council 1267 and its successor resolutions, domestic sanctions of individuals and entities under UNSCR 1373 may be a more feasible option. KABUL, Afghanistan — A cargo plane laden with 10,000 AK-47s landed in Kabul on Wednesday, the first part of a major Russian military aid package aimed at helping Kabul contain a resurgent insurgency. The delivery came almost three decades after the Soviet Union pulled out of Afghanistan in humiliation after a 10-year occupation. The anniversary of the withdrawal on February 15 was commemorated as a national holiday across Afghanistan. 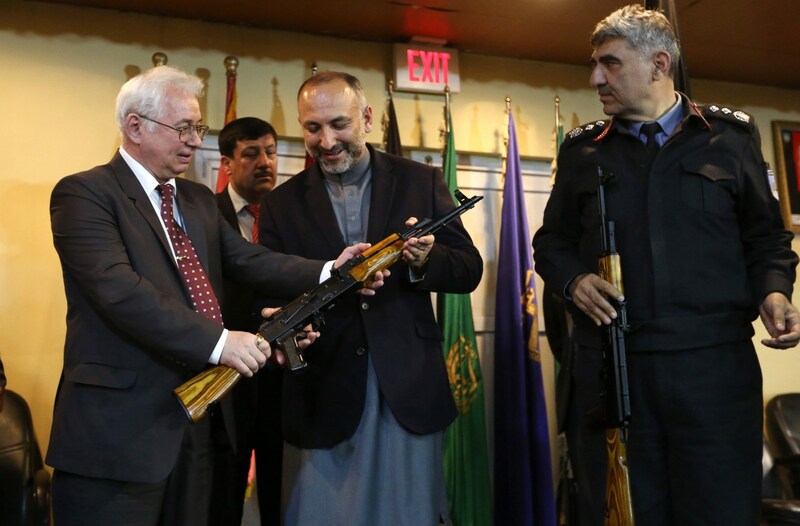 The assault rifles — ubiquitous weapons in war-ravaged Afghanistan — are part of a large package of Russian military aid that also includes helicopters and heavy weapons, Afghan National Security Council spokesman Tawab Ghurzang told NBC News. ISLAMABAD — Pakistan on Wednesday launched a push on the remaining pockets of Pakistani Taliban (TTP) fighters holed up in the remote Shawal Valley bordering Afghanistan. Though the advance had long been expected, the timing was surprising. News of the assault came from the military’s Inter Services Public Relations media branch as the head of the army, Chief of Army Staff (COAS) Gen. Raheel Sharif, flew to the Shawal Valley to meet troops stationed in forward areas before ordering the operation to commence. As well as calling for the terrorists to be flushed out of their hiding places in the heavily forested valley with numerous ravines, which facilitated infiltration from Afghanistan, Sharif called on their abettors across the county to be hunted down. Predicting the future in a confusing security environment is a challenge; with all the present fusions and fissions, it becomes even more challenging. The consistencies and inconsistencies, always, do not have a happy conclusion; the reason is obvious, the future is yet to happen! However, an analysis of strategic trends coupled with sound judgement does assist in minimising future shocks. The prospective outlook, however, can be affected by a flood of unpredictable trends, which inter-relate and inter-react dynamically, affecting sound analysis, and judgement. Some judgements and decisions, hence, factor in a few uncertainties and unforeseeable events, caused by quirks of human actions, but which, on occasions, can be reversed. The region, importantly South Asia, is fundamentally important to the global development. 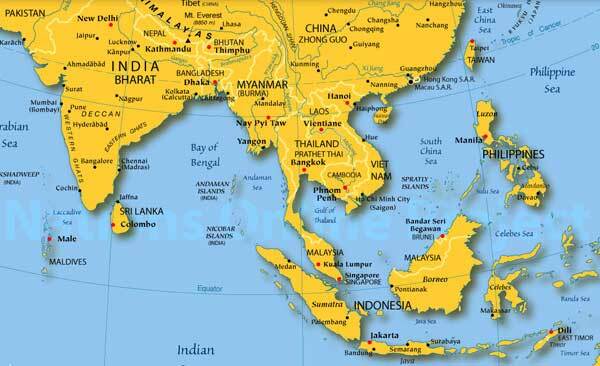 If present trends continue, China and India, in all certainty, will be the two dominant nations in the Asian region. WASHINGTON, D.C. — China’s recent actions to militarize the South China Sea have changed the operational landscape, and the U.S. Pacific Command needs more attack submarines and long-range surface missiles to keep up with the evolving threat, PACOM commander Adm. Harry Harris told the Senate Armed Services Committee today. China’s 10,000-foot runway in the Spratly Islands, as well as the addition of surface-to-air missiles and high-frequency radar systems on the islands over the past week, are pushing regional partners closer to the U.S. military but also forcing PACOM to look at addressing the region differently. “I think China’s… surface-to-air missiles, on Woody Island; its radars, new radars on Cuarteron Reef over here; the runway, the 10,000-foot runway… on Fiery Cross Reef and other places; these are actions that are changing, in my opinion, the operational landscape in the South China Sea,” Harris told the senators. BEIJING — This month, Chinese banking officials omitted currency data from closely watched economic reports. Just weeks earlier, Chinese regulators fined a journalist $23,000 for reposting a message that said a big securities firm had told elite clients to sell stock. Before that, officials pressed two companies to stop releasing early results from a survey of Chinese factories that often moved markets. Chinese leaders are taking increasingly bold steps to stop rising pessimism aboutturbulent markets and the slowing of the country’s growth. As financial and economic troubles threaten to undermine confidence in the Communist Party, Beijing is tightening the flow of economic information and even criminalizing commentary that officials believe could hurt stocks or the currency. DigitalGlobe via Getty ImagesThis week’s deployment of aircraft on Woody Island extends the reach of Chinese warplanes about 250 miles into the South China Sea. China is playing a game of chicken with the United States in the South China Sea. All signs suggest that Beijing is betting the U.S. will blink and swerve away before it comes to war. China is brazenly challenging the hegemony that the U.S. has enjoyed on East Asian seas since World War II, as the top U.S. admiral in the Pacific warns that a shrinking U.S. military is leaving him without sufficient forces to counter the rising superpower. This week’s fighting in Syria has seen major changes for the self-proclaimed Islamic State’s grip there, leaving some in the Pentagon wondering if ISIS is trying to expand its territorial hold or is in its last throes. This week, Kurdish forces pushed the terror group out of two cities —al Thawrah and Ash Shaddadi—that sit on supply routes for ISIS’s de facto Syrian capital, Raqqa. In Ash Shaddadi, Kurdish forces received substantial U.S.-led coalition air strike support. At the same time, ISIS appears to be making strides toward taking new cities in western Syria. The terror group has aggressively fended off a months long Russian-led defense of the central city of Palmyra, a city that many believe could serve as ISIS’s entrée into western Syria. And ISIS claimed responsibility for a series of deadly bombings Sunday in the city of Homs and the southern outskirts of Damascus that killed at least 200 people, potentially signaling its move on those cities. One of the cornerstones of the Islamic State’s arsenal is undoubtedly the improvised explosive device, or IED. And as the group attempts to hold what territory it has in Iraq and Syria, it has become a staple of the group’s defensive and offensive capabilities. The modern IED came of age during the early years of the last Iraq War, as bands of insurgents began attacking U.S. vehicles and patrols with hidden bombs made of unexploded ordnance, industrial supplies and whatever else could be squeezed into a container and made to explode. Countering the low-budget, highly lethal devices became a game of chess for the United States and its allies fighting in Iraq and Afghanistan. For every American widget put into the field, the enemy would make a bomb capable of, at the least, undermining it. But with the United States long wars of occupation winding down, groups like the Islamic State–who are now fighting opponents with little of the same capabilities the United States once brought to bear–are producing the weapons on an almost industrial scale. Cracks in Saudi-Egyptian relations: an opportunity for others to step in? Saudi Arabia is expected to reaffirm its policy of supplying Egypt with petroleum products as a contribution to help alleviate the country’s energy shortages. This subject will feature high on the agenda in the upcoming meeting between Egyptian President AbdelFattah al-Sissi King Salman of Saudi Arabia. The past few months have seen noticeable foreign policy disparities between Egypt and its Gulf allies, Saudi Arabia in particular. Are these of a nature that could affect the Egyptian energy sector, or even stability in Cairo? Muslim Brotherhood: Until recently, both Cairo and Riyadh viewed revolutionary Islamic groups like the Muslim Brotherhood as an existential threat. But, since the accession to power of King Salman in Saudi Arabia, and the rise of Iran as the major source of threat for the Kingdom, priorities are changing. While the MB are still perceived as the biggest threat in Cairo, Iran’s growing influence, in the region and beyond, has become the focus of all attention in Riyadh, which has learned to develop a necessary pragmatism towards the MB. On this point in particular, Egypt and the UAE still see eye to eye. Treaty proponents argue that if states are prohibited from conducting nuclear tests, non-nuclear powers will be unable to develop new nuclear weapons and existing nuclear powers will be unable to improve their nuclear arsenals. Both points are demonstrably false. Non-nuclear countries do not need nuclear testing to develop simple nuclear weapons or to produce nuclear weapons using designs and materials obtained from the black market. And, despite their pledges not to test nuclear weapons, Russia and China continue to significantly improve their nuclear weapon capabilities and add new warheads without high-yield nuclear testing. The Syria “cessation of hostilities” agreement seems all the stranger as huge unanswered questions regarding signatories, partners, monitoring, reporting, adjudication, and enforcement are raised. It seems more and more like something cobbled together without much thought as to how it might work in practice. Well, Turkey is a member of the ISSG, the stakeholders group. Ultimately, to be a part of that, you have – you’ve committed to implementing the cessation of hostilities. So again, it – we’ve talked about this a lot – it’s not just – we certainly point a finger at Russia quite often, and other members who are, we believe, taking counterproductive actions on the ground in Syria, but it’s incumbent on all members of the ISSG to buy into a cessation of hostilities. How’s that for clear diplomacy? The recent resumption of power generation at Kudunkulam nuclear power plant is a cause more for concern than it is for celebration, which has been an issue of fierce contention since 2011. Interestingly the story has again taken a twist where after two days of its restarting the plant stopped generation owing that the unit was tripped due to instrumentation deficiencies. NPCIL and Rosatom finalized the reactor design for the construction of KNPP phase one in 1998, which cost Rs140bn ($2.47bn) and it was supposed to have gone into operation in 2011. This all shows that the intricacies of nuclear issues has not undertaken despite adding more legs with an accelerated rate which can be catastrophic. People living in the vicinity of the area fear a disaster similar to the one at Japan’s Fukushima plant in 2011. Kudankulam is a small rural area, largely inhabited by fishermen and most of them belonging to the Christian community. Noam Chomsky, a famous American communications theorist, calls nuclear power a “very dangerous initiative, particularly in countries like India, which has had more than its share of industrial disasters, Bhopal being the most famous”. The Defense Information Systems Agency’s in-house, high-security suite of cloud services known as milCloud has, since its inception, remained an internal capability. But following the lead of other government agencies and even its own components, DISA now is opening the door to commercial providers for milCloud. The next iteration of milCloud aims to compete with the IBMs and Amazon Web Services of the world — sort of. There are stipulations, such as the commercial infrastructure must reside within DoD facilities and remain attached to DoD networks. It will, for all intents and purposes, be a contractor-operated, government-owned capability. "There are contractors willing and able to capitalize the initial site as well as the initial [certification and accreditation] process, so what does that mean? That actually means you pay for it. The government doesn’t fund it; you build it and then sell it back to make your money and recoup your investment. That’s a key point," Scott Stewart, chief of IT contracting for DISA's Defense Information Technology Contracting Organization, said Feb. 22 at DISA’s milCloud industry day. The dispute between Apple and the FBI over Apple's refusal to unlock an iPhone recovered from the alleged San Bernardino shooter Syed Farook marks another chapter in the ongoing battle between privacy and security in the internet age. While the FBI wants Apple to circumvent the iPhone's auto-erase mechanism after 10 failed login attempts and has a court order to strengthen its claim, Apple refuses to do so, claiming that such a software could serve as a master key to any iPhone should it fall into the wrong hands. Last week, Apple's CEO Tim Cook addressed the public in an open letter defending his company's stance on the matter, saying that following the government's demands in this case would set a dangerous precedent with respect to the safety of personal data. While tech companies such as Google and Facebook have voiced their support for Apple in the ongoing dispute, the American public is leaning towards the FBI on the issue. According to a survey conducted by the Pew Research Center, 51 percent of adults in the U.S. think that Apple should unlock the perpetrator's phone while 38 percent think that Apple is right not to cooperate. Even among the company's faithful, support is tepid at best: 47 percent of iPhone users think Apple should follow the FBI's orders vs. 43 percent who don't. In the case of the San Bernardino terrorists and the secrets that may be stored on their the Apple iPhones, they do! 'Apple said on Wednesday that it would oppose and challenge a federal court order to help the F.B.I. unlock an iPhone used by one of the two attackers who killed 14 people in San Bernardino, Calif., in December. On Tuesday, in a significant victory for the government, Magistrate Judge Sheri Pym of the Federal District Court for the District of Central California ordered Apple to bypass security functions on an iPhone 5c used by Syed Rizwan Farook, who was killed by the police along with his wife, Tashfeen Malik, after they attacked Mr. Farook's co-workers at a holiday gathering. Megacities and Dense Urban Environments: Obstacle or Opportunity? The United Nations (UN) projects that by 2030 there will be more than 41 megacities, with the majority of them located in Africa and Asia. These 41 cities alone will house approximately 9% of the world’s population, as rural life declines. [i] Approximately 54% of the world’s people are now urban residents, with 66% expected to be urban by 2050. [ii] More alarming, the number of people worldwide living in urban slums has increased by 33% since 1990. [iii] As rural to urban migration continues to increase, experts expect more frequent requirements for the U.S. military to be involved in responding to conflicts and disasters in densely populated urban environments. As more of the world population resides in littoral cities, natural disasters such as hurricanes, floods, health epidemics, and resource scarcity could pose significant challenges for military intervention. “While the U.S. military continues to protect U.S. national security interests across the globe, it must focus on protecting those interests where they are in most jeopardy. The greatest potential threats to those interests lie in Asia and the Middle East, and the U.S. Army’s role extends to both.”[iv] Of the 41 projected megacities, 25 are located in the Asia-Pacific and Middle East regions. Doctrine further recognizes the potential for urban areas to become redoubts for enemy forces and acknowledges that “joint operations will require land forces capable of operating in congested and restricted urban terrain,”[v] thus indicating U.S. doctrinal intent to operate within megacities and dense urban environments. In short, megacities and dense urban environments are firmly on the horizon as likely and potential environments for future warfare and humanitarian engagements. Are we prepared? The United States has nearly as many combat capable forces deployed in all of Europe today as it did in Germany’s Fulda Gap during the Cold War. Yet the continent is no longer at peace. Our defense policies in Europe have become outdated and weak. As the alliance moved east, NATO forces remained waiting in the Fulda Gap. These policies have left the stage open for a revisionist-minded Russia to toss aside the current international framework. Russia has tested NATO from Estonia to Turkey with no credible military deterrent opposing it. The United States needs to reassert its military leadership role in Europe. It needs to counter Russia’s provocations through bold actions to restructure its military posture. NATO should re-deploy from its current German-Italian defensive line to a modern Poland-Romania line. The forces deployed should be credible and highly capable of operating in a conventional warfare environment. George Washington resigned as commander-in-chief of the Continental Army on December 23, 1783, ending a career that spanned more of his adult life than his combined years in the Continental Congress and as president. Today, just two days after his birthday, I wonder what Washington would think about the role education plays in the development of our military, particularly given our long season of war. On one hand, Washington would be pleased to know that men and women of the armed forces are among the best and brightest of their generation. According to data from George Washington University, in 2010, 82% of military officers held at least a bachelor’s degree. Ninety-three percent of enlisted soldiers had a high school diploma. Yet while recruiting America’s brightest for the armed forces remains a national priority, there has also been an alarming rise in the number of men and women ineligible for military service in recent years. In 2010, for example, a group of retired military leaders commissioned a report titled Too Fat to Fight. The report found that 75% of Americans age 17 to 24 are unable to join the military because they “failed to graduate high school, have criminal records, or are physically unfit.” In fact, the Army’s Accessions Command has estimated that 9 million men and women could not join the military if they wanted to because they are unable to pass the fitness test. The news is filled with stories about how U.S. children are slipping way behind other countries when it comes to key educational benchmarks. But the corollary is that these children grow up -- and as a result of the poor or inconsistent education standards in their younger years, many Americans don't have the grounding to be successful in higher education without remedial classes. Federal statistics show 19 to 26 percent of all college freshmen are identified as needing remedial courses. That figure typically is lower on four-year campuses and climbs to 60 percent for some two-year schools, according to a recent report from state governors. The stats are alarming because these are students who have received high school diplomas and thus have been certified as having attained basic educational proficiency. It is an appalling state of affairs when so few young Americans meet the educational threshold to serve. While symptomatic of a nationwide problem that portends a raft of problems for American economic competitiveness, it also has stark ramifications for our national security if we don’t, or can’t, reverse it. importance of reading and military history for the officer, even where it might seem that one was “too busy to read.” His response went viral over email – had it been in the time of Twitter this blog piece would be unnecessary. But it enjoyed a wide distribution within the Marine Corps, and eventually arrived in my inbox. As a military historian, I cannot minimize my appreciation that he wrote so eloquently on the subject. If it were only for that, the essay would be valuable. But his writing is valuable also because we rarely have opportunities to hear the unfiltered thoughts of leaders as well for his role in the history of recent conflicts. Much is written and [believed to be] known about the General as a warrior. Less is known about him as a true student of his profession. I would submit that it is quite impossible to correctly understand the former without a proper interrogation of the latter. By this I mean that one must first accept that a significant body of intellectual material sustains his actions and opinions – as is indicated in the messages, he devotes real effort to this aspect of his work. So, there is a base of knowledge that is always growing. On top of that are the benefits which accrue to those who think and critically engage with such material. Furthermore, there is his consideration of the views of others – as in the breadth of his reading or response to my comments – suggesting that he had not fallen prey to the hubris of the powerful, which is to believe they have all of the answers. Good leaders don’t only hear “yes” from the people around them. Thus, the insight these words give to his thinking and interests is invaluable.